Like the evocative landscape painting, but on a more immersive scale, a rare ivory field 19th century Persian Sultanabad, carpet adds the element of art to this modernized British living room with its striking custom designed furniture. 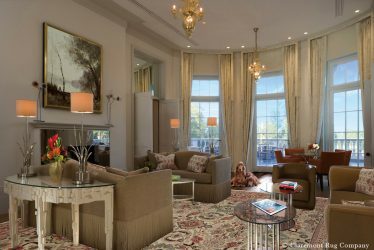 While it may initially seem counterintuitive, we often receive requests from clients regarding how to add antique Oriental rugs into contemporary designed residences. 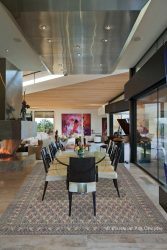 They come to see what I first discovered 20 years ago when a client asked us to incorporate a collection of 19th century rugs into a newly built, expansive contemporary residence in Washington State. I observed that 21st century architecture is inclusive. Its open floor plans, voluminous spaces and use of exotic woods, stone and metallic materials can combine perfectly with the age-old naturalistic patterns and time-softened, vegetally dyed palettes of antique Oriental rugs. A perfect example is the Los Angeles-area home of Jennifer Aniston, who has lately become an oft-quoted interior design aficionado who applied her modernist ethic by softening the sharp lines intrinsic to contemporary architecture. This light-hued, extremely refined antique Persian Tehran carpet makes a major contribution to the symphony of surfaces in this innovative contemporary space. Its light base and delicate, pinpoint allover design widens the spectrum of tactile experience, adding important detail and texture to the polished metal, marble, mahogany and glass. A recent article describes her residence as “Old World meets New World, a polyglot mix of hand-painted wallpaper and midcentury furniture, Oriental rugs and polished concrete, antique Japanese screens and Abstract Expressionist paintings.” The article includes photos of her contemporary designed study, which is counter-balanced by the earth tone palette and delicate floral lines of a 19th century Persian Tabriz rug. With their painstaking detail work and array of earth tone hues, antique Persian Tabriz rugs woven in the workshop of the master carpet designer, Hadji Jallili, are a profound pairing with the exotic woods and stones of much contemporary architecture. In reading this article, I had an immediate affinity with Ms. Aniston’s thought process. Many of our clients’ homes are similarly strikingly modern, with enormous rooms, soaring ceilings and fewer defined spaces than more classical homes. Importantly, what these homes lack is an anchor to ground them and what they need is more soft surfaces to enhance the tactile element. Antique Oriental rugs accomplish both. When working with clients who have contemporary residences, we often suggest that they select rugs to effectively define space and to create intimate conversation areas in expansive rooms. We also use rugs to add color to the walls which in contemporary homes are often in metallic or neutral tones. Offering an organic sensibility from their entirely natural materials and dyestuffs, an extended suite of 19th century Persian Laver Kirmans, beloved for their keenly observed, delicate botanical motifs, grace this all green Leeds Certified home. Decor: Sherry Williamson Design, Inc. While I have now worked with clients on a few hundred contemporary homes, I have fond memories of two in particular. In one, a grand townhouse in Greenwich Village, our client wanted an appropriate environment for an important painting that he had just hung. The gentleman made a point of telling me that he derived as much satisfaction from the suite of carpets that created a hallway leading up to the painting as he did from the painting itself. The other was a collaboration with clients with a magnificent contemporary residence on Cape Cod that houses a major art collection. They wanted a single rug to grace their living room. We worked closely together to create a Whole Home Rug Display of 28 High-Collectible and Connoisseur-Caliber antique rugs that helped build the full impact of the art. 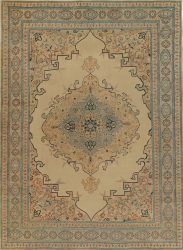 One of the attributes of antique Persian and tribal rugs is their tremendous variety in size, in style, in colors and in hues. They have the ability to create fully developed environments, to establish ambient spaces and to be inclusive with the furniture and art work that share the space with them. They become an artistic and emotional bridge between the contemporary and the traditional, each enhancing the other.